Protector & Scoring System: At the WTF President’s Cup DAEDO is being used as PSS(GEN2). The Organizing Committee will provide DAEDO trunk protector and DAEDO E-headgear. Each athlete has to bring his own DAEDO sensor socks. Cadets: top four (4) European Medallists qualify directly for the WTE Cadet Championships 2018 and/or 1st European Teakwondo Multi Games 2018. Juniors: top four (4) European Medallists qualify directly for the WTE Under 21 Championships 2018 /If the age criteria of the athletes are met and/or 1st European Teakwondo Multi Games 2018. Seniors: top four (4) European Medallists qualify directly for the WTE European Senior Championships 2018 (Kazan Russia 10-13/5/2018) and/or 1st European Teakwondo Multi Games 2018. 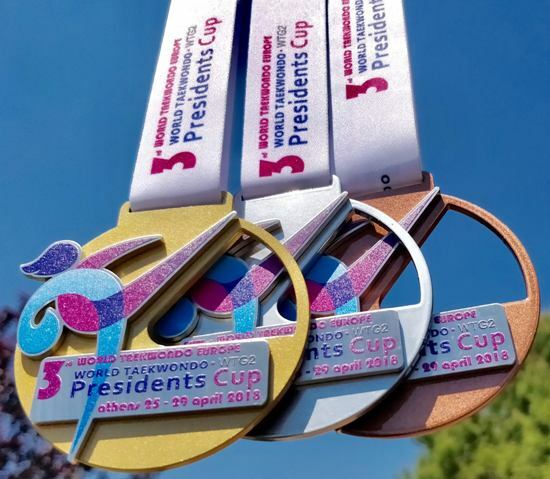 Earned ranking points from President’s Cup in Europe by European athletes will be outside of 40 points limitation.